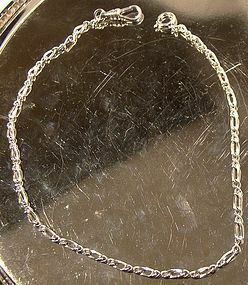 A sterling silver with rhodium plate watch chain circa 1950s-1960s. 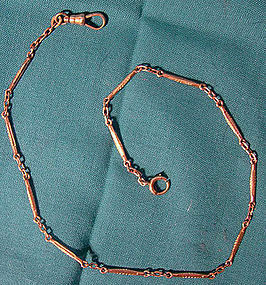 This vintage 13-3/8" length watchchain has alternating extended links with a figure-8 connecting loop. This pocket watch chain accessory has a swivel and a spring-ring clasp and it weighs 7.0 grams. 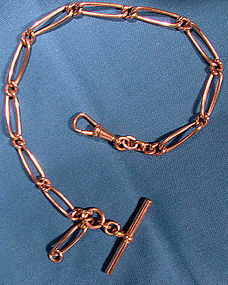 It is stamped STER with a maker's mark on the jump ring and STERLING on the swivel. It is in excellent condition with no dents, bends, corrosion, losses, damage or repairs. All condition issues are noted. Tracked packet parcel to anywhere in the US is $14, other spots may vary. Insurance/tracking included. Items paid with a credit card will be sent to confirmed addresses only. All of our prices are in $US. PLEASE NOTE: WE DO NOT ACCEPT PAYPAL, only VISA and MASTERCARD. 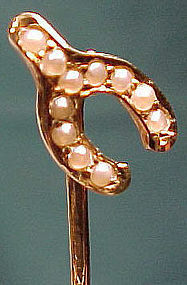 A 14k onyx & pearl cravat or tie bar pin circa 1915-20. 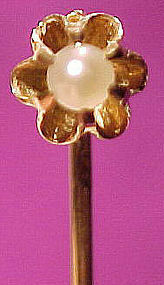 This vintage 1-7/8" long pin has a central genuine pearl set into an oval 3/8" x 1/4" onyx stone. It has a safety clasp, it weighs 2.6 grams, and it is in excellent vintage condition with no chips, cracks, dents, bends, corrosion, losses, damage or repairs. All items are thoroughly and conservatively graded and all condition issues are noted; all items are vintage or antique and may have slight signs of gentle use. Expedited tracked and insured parcel shipping to the U.S. starts at $19 (other spots may vary, air is higher). Items paid with a credit card will be shipped to confirmed addresses only. We do ship internationally. All of our prices are in $US. PLEASE NOTE: We DO NOT accept PayPal. 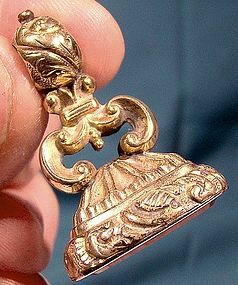 A George III gilt brass and intaglio glass seal fob circa 1780-1800. 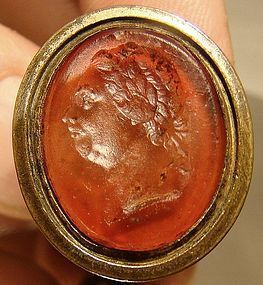 This 1-3/16" high desk writing accessory features an inset intaglio carved carnelian glass portrait of the English King George III of England. 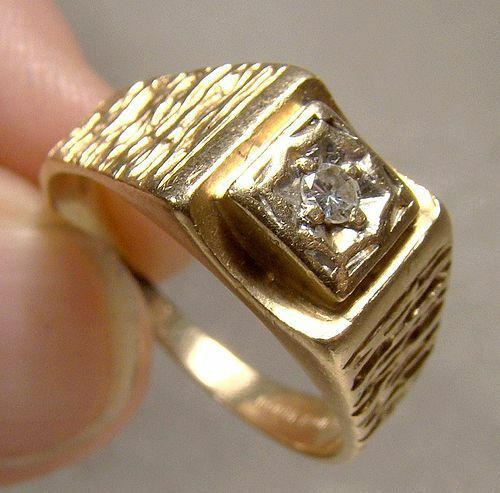 It is in very good condition with no chips, cracks, dents, bends, corrosion, losses, damage or repairs other than the expected dirt and manufacturing irregularities seen in hand made items of this age, and the loss of most of the gilding of which some traces remain. An interesting artifact. All items are thoroughly and conservatively graded and all condition issues are noted; all items are vintage or antique and may have slight signs of gentle use. Expedited tracked post to the U.S. starts at $17.50 (other spots may vary). Items paid with a credit card will be shipped to confirmed addresses only. We do ship internationally. All of our prices are in $US. PLEASE NOTE: We DO NOT accept PayPal, only VISA and MASTERCARD. A hand engraved Georgian 9k yellow gold and RGP engraved watch key. This 1-7/8 x 3/4" winding key features a rolled gold plate rotating swivel loop and a rotating knob on the RGP winding shaft. Both have underlying metal for rigidity and resistance to wear (gold is very soft), but the body of the key tests as 9 carat gold (the key is unmarked). It weighs 9.0 grams, and it is in excellent condition with no monograms, dents, bends, corrosion, losses, damage or repairs. All items are thoroughly and conservatively graded and all condition issues are noted; all items are vintage or antique and may have slight signs of gentle use. Expedited tracked and insured parcel shipping to the U.S. starts at $22 (other spots may vary, air is higher). Items paid with a credit card will be shipped to confirmed addresses only. We do ship internationally. All of our prices are in $US. PLEASE NOTE: we DO NOT accept PayPal, only VISA and MASTERCARD. 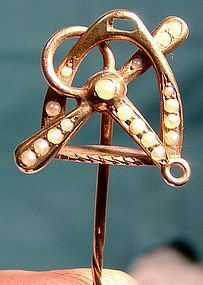 A 14k seed pearls equestrian / polo cravat stickpin circa 1900. 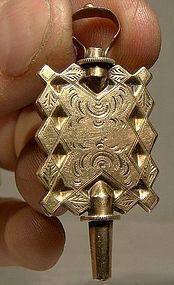 This antique late Victorian period 14k yellow gold stickpin or tie pin is unmarked but tested and it is 2-5/8" long and the top measures 5/8" across. It is set with genuine seed pearls, in both the stirrup and horse halter (we think). It weighs 2.8 grams, and it is in excellent condition with no chips, cracks, dents, bends, corrosion, losses, damage or repairs. All items are thoroughly and conservatively graded and all condition issues are noted; all items are vintage or antique and may have slight signs of gentle use. Expedited tracked and insured parcel shipping to the U.S. starts at $20 (other spots may vary, air is higher). Items paid with a credit card will be shipped to confirmed addresses only. We do ship internationally. All of our prices are in $US. PLEASE NOTE: We DO NOT accept PayPal. A vintage Regency period rolled gold plate watch fob with a carnelian stone. 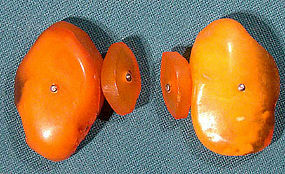 This 1-3/8" high man's watch accessory measures 7/8 x 3/4" across the bottom, and the carnelian stone has never been engraved or carved. This fob is unmarked and the plating is intact, and this c1830s item is in excellent condition with no chips, cracks, dents, bends, corrosion, losses, damage or repairs. All items are thoroughly and conservatively graded and all condition issues are noted; all items are vintage or antique and may have slight signs of gentle use. Expedited tracked parcel shipping to the U.S. starts at $20 (other spots may vary, air is higher) - tracking and insurance are included in shipping quotes. Items paid with a credit card will be shipped to confirmed addresses only. We do ship internationally. All of our prices are in $US. PLEASE NOTE: we DO NOT accept PayPal, only VISA and MASTERCARD. 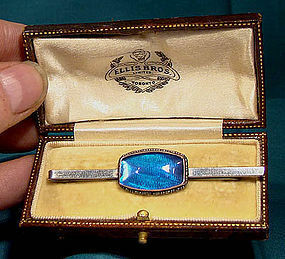 An Ellis sterling silver butterfly wing tie bar circa 1910 - 1920 in a vintage case. This Edwardian vintage 2-3/4" x 5/8" tiebar has a central butterfly wing decoration under glass. 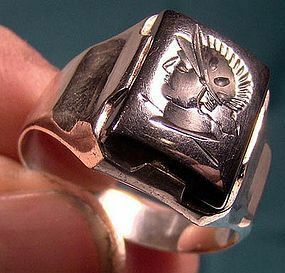 It is stamped ENGLAND on the back and it tests as sterling silver. It comes in a period satin and velvet fitted Ellis Bros. box from Toronto (later bought out by Birks). 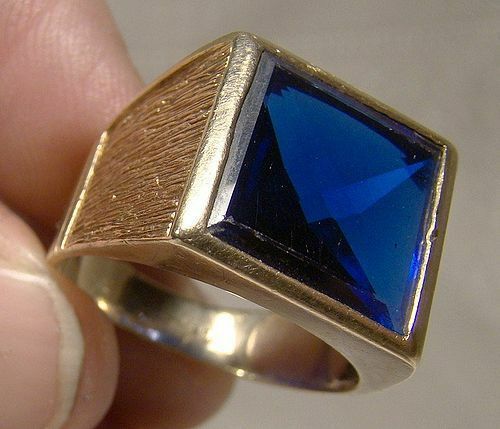 The brown gold-stamped box has one scrape on the top, and this man's fashion accessory weighs 5.3 grams. This item is in excellent condition with no chips, cracks, dents, bends, corrosion, losses, damage or repairs. All items are thoroughly and conservatively graded and all condition issues are noted; all items are vintage or antique and may have slight signs of gentle use. Tracked packet air insured post to the U.S. starts at $13.50 (other spots may vary) - insurance is included. Items paid with a credit card will be shipped to confirmed addresses only. We do ship internationally. All of our prices are in $US. PLEASE NOTE: we DO NOT accept PayPal, only VISA and MASTERCARD. A vintage 1920s Art Deco era gold long link necklace in 14k white and yellow gold. 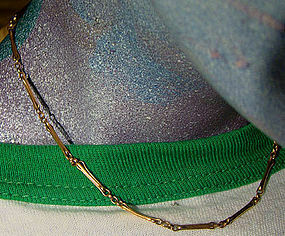 This 13-3/4" necklace consists of 1/16" wide alternating white and yellow gold rod links. It has a spring-ring catch on one end and a swivel on the other. It is stamped 14K on the jump rings, it weighs 9.2 grams, and it is in excellent condition with no dents, bends, corrosion, losses, damage or repairs. All items are thoroughly and conservatively graded and all condition issues are noted; all items are vintage or antique and may have slight signs of gentle use. Surface tracked insured post to the U.S. starts at $21 (other spots may vary). Items paid with a credit card will be shipped to confirmed addresses only. We do ship internationally. All of our prices are in $US. NOTE: we DO NOT accept PayPal, only VISA and MASTERCARD. 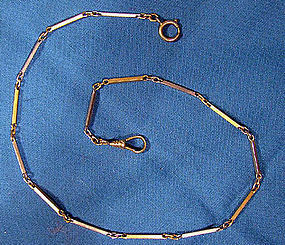 A vintage c1915-20 long link 13-1/4" watch chain in 14k yellow gold. This chain measures 1/16" wide, it has a springring catch (marked 14K) and a swivel (obscured mark), and it weighs 6.4 grams. This item is in excellent condition with no dents, bends, corrosion, losses, damage or repairs. All items are thoroughly and conservatively graded and all condition issues are noted; all items are vintage or antique and may have slight signs of gentle use. Surface tracked insured shipping to the U.S. starts at $18 (other spots may vary) - insurance is included in shipping quotes. Items paid with a credit card will be shipped to confirmed addresses only. We do ship internationally. All of our prices are in $US. PLEASE NOTE: we DO NOT accept PayPal, only VISA and MASTERCARD.